Indian Woman -Top 10 Women Politicians in India -Nepal’s Terai party wrests tax relief for Indian transporters -Neither UPA nor NDA will get majority: Psephologist -Cyber cafes, phone booths under surveillance in U.P. The late Kanshi Ram may have been the soul of the Bahujan Samaj Party but it was Mayawati, his chosen heiress, who was its face. 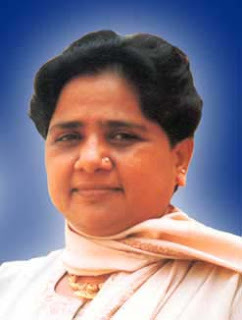 (born January 15, 1956) is a Indian politician and the current Chief Minister of Uttar Pradesh. She has been the Chief Minister on three other short-lived tenures but her party holds the absolute majority in the state on this occasion.Kumari Mayawati was born in Delhi. Her father Prabhu Das was a clerk in the telecommunications department in Delhi. Her mother is Ram Rati. She graduated from Kalindi College in Delhi and holds a Bachelor of Education degree, and was a teacher in Delhi (Inderpuri JJ Colony) until joining full time politics in 1984. At one point she also studied for the Indian Administrative Service examinations. However, after meeting Kanshi Ram in 1977, she gradually came under his patronage, and was part of his core team when he founded the BSP in 1984.In 1984, Kanshi Ram founded the BSP as a party to represent the Dalits, and Mayawati was one of the key people in the new organization. In 2001, Kanshi Ram named her as his successor. National News From India updated daily from Delhi. Kathmandu, Sep 30 (IANS) Nepal’s debutant Terai Madhes Loktantrik Party (TMLP), which emerged as the fifth largest party in the April general election, has been able to wrest a major tax relief for Indian vehicle owners, especially transporters, plying along the border. The TMLP, formed by former ministers and lawmakers from national parties to espouse the cause of Madhesis - people of Indian origin living in the Terai plains, paralysed the interim parliament Monday and relented only after Finance Minister Baburam Bhattarai agreed to withdraw the new cess imposed on Indian vehicles entering Nepal even for a very brief period. Last year, the then finance minister Ram Sharan Mahat had waived tax on Indian vehicles that entered Nepal provided they returned within 24 hours. India also reciprocates the gesture for Nepali vehicles entering India for a day. However, this month, the first Maoist budget unveiled by Bhattarai slashed the waiver, partly in a bid to raise funds for the ambitious budget and partly to regulate traffic in the border areas. Soon after the diktat, protests erupted on the Indian side of the border, with the ruling Bahujan Samaj Party (BSP) of India’s Uttar Pradesh state and other Indian organisations demonstrating against it. The TMLP took up cudgels on behalf of the protesters, obstructing the constituent assembly - Nepal’s interim parliament - and demanding that the decision be revoked. Hridyesh Tripathi, a former minister and powerful Terai MP, said the tax would hit the passage of goods from India and would affect people living along the border, creating red tape and additional complexities. Also, people living in the border areas have relatives in both countries and are wont to travel across the border for education, work and medical treatment oftener than travelling to Kathmandu. Finally, the finance minister gave an undertaking in writing late in the evening, agreeing to withdraw the levy on Indian vehicles that entered Nepal only for a day. Transporters on both sides of the border have also been complaining of lack of security and extortion by both security and customs officials as well as political parties. Thiruvananthapuram, Sep 29 (IANS) Neither the ruling United Progressive Alliance (UPA) nor the opposition National Democratic Alliance (NDA) would have a clear majority in the next Lok Sabha elections, noted psephologist Yogendra Yadav predicted Monday. ‘No single pre-electoral alliance will have a clear cut majority and the worst losers will be the Left parties. While the Congress party will be able to hold on, its allies will be badly hit. Likewise, the Bharatiya Janata Party (BJP) will lose badly in states like Rajasthan, Madhya Pradesh and Orissa,’ Yadav said at a seminar organised by the Kerala University’s political science department here. ‘It is only one way the tally of the Left will go and it will go down. From a historic high in the May 2004 polls, it would reach a historic low in the next polls. In Kerala, the performance of the Left will be poor,’ he said. As far as the performance of the Bahujan Samaj Party (BSP) is concerned, the psephologist said it may not get the around 50-60 seats they are expecting to win. ‘But they will play an important role and a government can be formed only with the outside support of two big parties,’ Yadav said. Yadav has been in Kerala for the past few days and is doing an in-depth study on the prospects of various political parties. Cyber cafes, phone booths under surveillance in U.P. Allahabad: The recent spurt in terrorist activities and links connecting many of the suspects to Uttar Pradesh have brought cyber cafes and telephone booths across the State under police surveillance with the former asked to install CCTVs. “Police officials across the State have received instructions from the Director General of Police to keep a tab on the cyber cafes and PCOs, which have become an integral part of modus operandi of terrorist groups,” Allahabad Zone Inspector General of Police Pramod Kumar Tiwari told PTI. He said instructions to this effect were given by the DGP Vikram Singh last week after a meeting, headed by the Chief Minister Mayawati, called to discuss strategies to thwart any possible terrorist strikes in the State. Uttar Pradesh has been hit by a number of terrorist attacks in places such as Ayodhya, Varanasi, Lucknow and Gorakhpur, he said. “As a part of the administration’s anti-terror mechanism, cyber cafes have been asked to install CCTVs to keep a record of visitors…Keeping a record of the names and other details of the users had been a practise earlier, though it turned out to be deficient as a person involved in a big conspiracy is unlikely to divulge his true identity,” Mr. Tiwari said. “Besides, PCO owners have been asked to keep a log of calls made from their numbers. They have especially been directed to keep a record of overseas calls and make the details available to the police whenever required,” the IGP said. “Directions to this effect have already been given to cyber cafes and PCOs owners. Police stations in-charges also have been instructed to regularly carry out inspections of cyber cafes and PCOs within their respective jurisdiction and ensure compliance with the directions and report any development that arouses suspicion,” he added.